Born in Venice, the son of a physician or apothecary, Carlo Goldoni (1707–93) used to wander Venice in his three-cornered hat, eavesdropping on conversations; often, he claimed, a mere turn of phrase would inspire his next play. By the smile on the jolly face of his statue in Campo San Bartolomeo, he still finds his fellow citizens amusing, and if he needed fresh material, he’d find plenty every evening around 7pm, when the Venetians would gather for a chat during their evening stroll. Like Hemingway, his nickname was ‘Papa’. As a young man, Goldoni was interested in the theatre, and though his family sent him to law school and did everything they could to keep him from becoming a playwright, it wasn't long before he realized his great gift was for comedy. Goldoni's comedies are witty and mannerly, with an evident love and fascination for the human condition and its foibles. Although he was inspired by the Commedia dell'Arte traditions, his situations were always recognizable to the average middle class Venetian. He got rid of the masks, and made the often outrageous street theatre that preceeded him in Italy into something more mannerly and scripted. His idol was Molière, and his best plays (he would write 120 in his lifetime, including Il servitore di due padroni, La Bottega del Caffe, La Locandiera, Un Curioso Accidente, Il Vero Amico) still delight today. 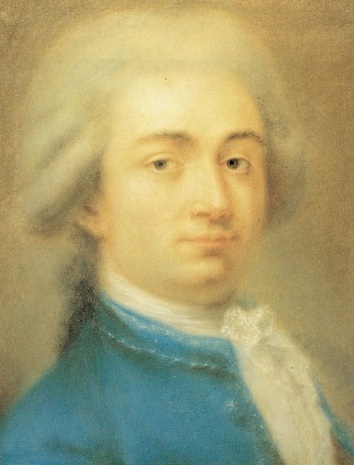 In 1757, he and his arch rival Carlo Gozzi, engaged in a furious literary battle: Gozzi accused Goldoni of taking the fantasy and imagination out of the Commedia. Gozzi's increasingly popular plays left Goldoni fuming at the poor taste of his compatriots, and he left Venice for good in 1761. He relocated to Paris, where he was welcomed into the French court as manager of the Theatre Italien. From then on he wrote most of his plays in French, including his acclaimed Le bourru bienfaisant, written for the marriage of Louis XVI and Marie Antoinette in 1771. After the French Revolution, however, he lost the pension granted by the king and died in poverty, although right after his death it was restored by the Convention to his aged widow, thanks to the intervention of the poet André Chénier. Goldoni's house in Venice is now a museum; for more, see this website devoted to his life and works in English.